Come and go at any time during this our craft day. We will have tables and chairs available for you to use for your crafting needs. This is the perfect opportunity to bring that project that has been finished because there’s never enough time, or start that project that hasn’t been given a chance yet. 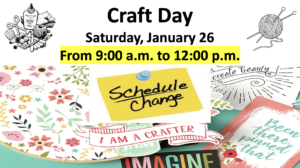 If you have any crafty friends, invite them for a day of fun with you. We would love to get the chance to meet them.